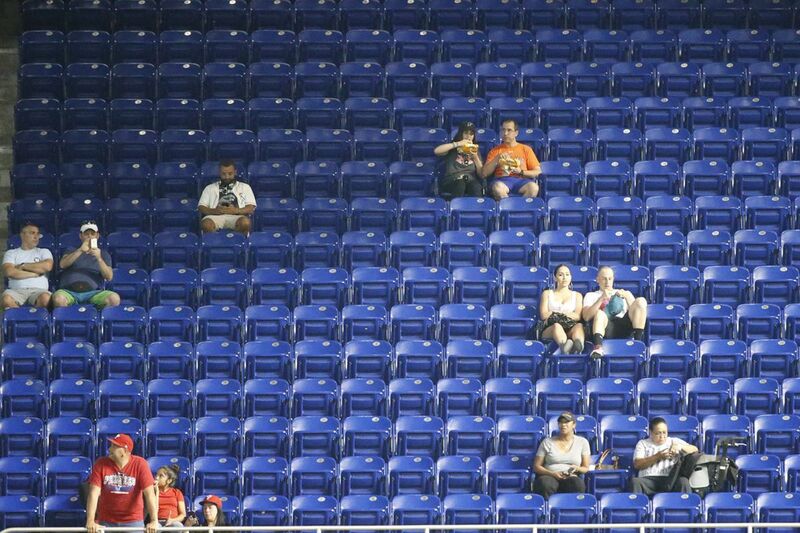 There were plenty of empty seats in the stands at Marlins Park in Miami Monday night during the first inning of a game between the Phillies and the Marlins. Marlins Park, the high-tech stadium built in March 2012 as the new home of the Miami Marlins, is among the smallest in the league, with a capacity of just 37,442. But Monday night, there were many, many seats to spare. The paid attendance for the Marlins' 8-4 win over the Phillies was just 5,415, the smallest announced crowd ever at the ballpark and a staggeringly low number for a Major League Baseball game, even by Marlins standards. So far this year, the team is averaging just 11,892 paid fans a night, the lowest in the league and down considerably from last year's paltry numbers. Of course, weak attendance is nothing new for the Marlins, who have struggled to fill the seats since entering the league in 1993. For one game last May, Associated Press sports reporter Steve Wine estimated that fewer than 1,600 people were actually in their seats, despite an announced paid attendance of 15,197. "It's a good day to get a foul ball," Wine joked on Twitter. The Phillies are one of the few teams in the league that have seen an upswing in attendance numbers. So far this season, the Phillies are averaging more than 2,000 more paid fans per game compared with last year. But, last season, the team's attendance numbers were the second-worst in the history of Citizens Bank Park. In order to help increase attendance, the team added several new amenities to the ballpark this season, including a P.J. Whelihan's in Ashburn Alley and a new,13,000-square-foot fun zone for kids called The Yard. A hot dog launcher that kids can use to test their marksmanship seems particularly popular. A rendering of The Yard, a new play space at Citizens Bank Park. Outside of Philadelphia and a handful of other markets (the Houston Astros have experienced the most growth), the decline in attendance is a league-wide problem. Paid attendance is down more than 10 percent compared to this time last year, according to the number crunchers at Baseball Reference, equating to the loss of more than 146,000 fans through just the end of April. And unlike the Marlins, who began more accurately counting paid attendance this season, nothing has changed in the way teams tally their attendance numbers. It's a troubling trend for baseball, which has seen attendance declines for the past three seasons. Last year, total attendance dipped below 73 million for the first time since 2002. It's not just smaller teams experiencing declines in attendance. The Boston Red Sox are averaging nearly 2,800 fewer fans per game, while the Washington Nationals are drawing nearly 4,200 fewer fans per game. Even the Texas Rangers, who haven't been as susceptible to the bad weather that hindered many teams in the Northeast in April, are down nearly 3,900 fans per game. All told, there are six teams (including the Marlins) that have seen attendance declines more than 8,000 people per game. Some teams are taking approaches beyond $1 dog night to combat waning attendance numbers. On April 17, the Oakland Athletics gave away free tickets for the Tuesday night game against the Chicago White Sox, which drew the team's biggest crowd of the season at 46,028 (though MLB will not count it toward the team's official paid attendance figures). Meanwhile, the Baltimore Orioles are giving away two free tickets to kids ages 9 and younger when an adult buys an upper deck ticket.